Other than the dark recesses of the family minivan, no other place in my life seems to collect odds, ends, grit and grime like my garage does: scattered shoes, filthy tools, toys, overflowing recycle bins, leaky birdseed bags that the local squirrel chewed through. Life gets busy, and the garage becomes a convenient dumping ground. If you are like me and find cleaning your garage to be about as much fun as getting a cavity filled, try this five-step method. Depending on the size of the job, you could accomplish this task in five hours or – if you don't have a block of time – do one step a day for five days. Either way, you'll be so glad you did! By the way, this method works for sheds, carports and storage units, too. First, determine your goals. How do you want to use your space? If you can't walk across the floor without hurdling something or stubbing your toe, it's time to prioritize. My family's garage is mostly for parking our two cars. We also use it for storage: landscaping tools and equipment, household chemicals and solutions, bicycles, lawn chairs, a large freezer, kayaks and related kayaking equipment. My husband competes in triathlons and I love to garden, so we have to make room for our hobbies, too. Second, decide your categories. Group the like contents of your garage according to activity (you might want to leave the vehicles outside for this step). Include categories that match your priorities. For instance, our categories are gardening and landscaping, home maintenance, recreation, triathlon, trash and recycling, and vehicle storage. Include a category called: Stuff That Belongs Somewhere Else! Don't we all have things that never make it from the garage to the house for some reason? Take time to gather up the items that need to go inside and remove them from the garage now. Third, declutter the space. As you lay out the contents of your space, do you notice duplicates? Toys or tools you haven't used in years? Belongings that represent another era of your life or aspirations that never materialized? Plan to donate or sell those items. For example, because I grew up camping, I always assumed the Peters family would be a camping family. Turns out we are a hotel family instead! I gave the tents and sleeping bags we weren't using to friends, but I also could have passed them along to local charities or scout groups. What organizations could use your neglected items? See sidebar below. Fourth, deliver the goods. Consolidate the stuff you want to get rid of as you're sorting it – plop it right into boxes or bags for prompt delivery to the destination of your choice. Sometimes I will even back up the car and leave the trunk open, so I can put my donations in the vehicle for speedy drop-off. Dropping off items can feel painful; even if we no longer need them and even if it's for a worthy cause or a little extra cash. Recent brain research shows that giving away belongings stimulates areas of our brain that register minor injuries, like paper cuts! No matter what I give away – even old Tupperware – I always feel a little hollow inside. But the next day I am hard-pressed to remember what I donated. Five, decompress and reward yourself for decluttering! Invest in some new storage shelves or containers that really work well in your space. Pull your vehicles in and enjoy having them out of the weather. 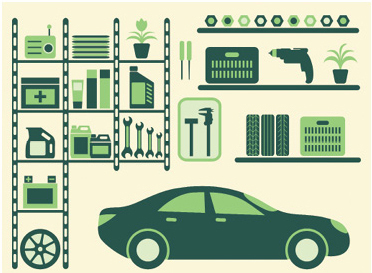 Sweep out the corners, dust off the cobwebs, and pat yourself on the back for tackling your cluttered garage. • Donate gently used clothing, household supplies, small appliances, furniture, tools, textiles, books and toys to charities such as Salvation Army, Big Brothers Big Sisters of Alaska, Arc of Anchorage and Fairbanks Resource Agency. These organizations have established central drop-off points and, in some locations, offer free scheduled pick ups. • Habitat for Humanity Restore takes construction and building supplies, tools, landscaping equipment and supplies, furniture, fixtures and large and small appliances. • Check with food pantries and homeless shelters to see how your belongings could help needy folks in your area. • Donating a vehicle – in any condition – is a great way to help others. Learn more about the Red Cross Vehicle Donation Program at redcross.org. Thrift stores: Value Village, Alaska SPCA Thrift and other second-hand stores take household items, small appliances, furniture, clothing and more. Utilities: Donate your old energy-hogging garage fridge, freezer or water heater to your local utility. Schools and daycares: Donate your gently used children's recreational equipment to programs near you. Nursing homes: Check to see what items they accept. Vocational school programs: Many high schools have building trades programs that could use extra construction equipment and tools. Libraries: Donate old books and magazines to your local library. Want to make money selling your stuff? Consider consignment stores such as Second Run, Play it Again Sports, Title Wave Books; yard and garage sales; and online sales such as Craigslist and eBay. For getting rid of junk: 1-800-GOT-JUNK? picks up appliances, mattresses and furniture, carpet, TVs, tires, hot tubs and scrap metal. For household chemicals, cleaning solutions and anything that needs special disposal: Check with your county solid waste management district office. Many times they have facilities to handle hazardous waste disposal.